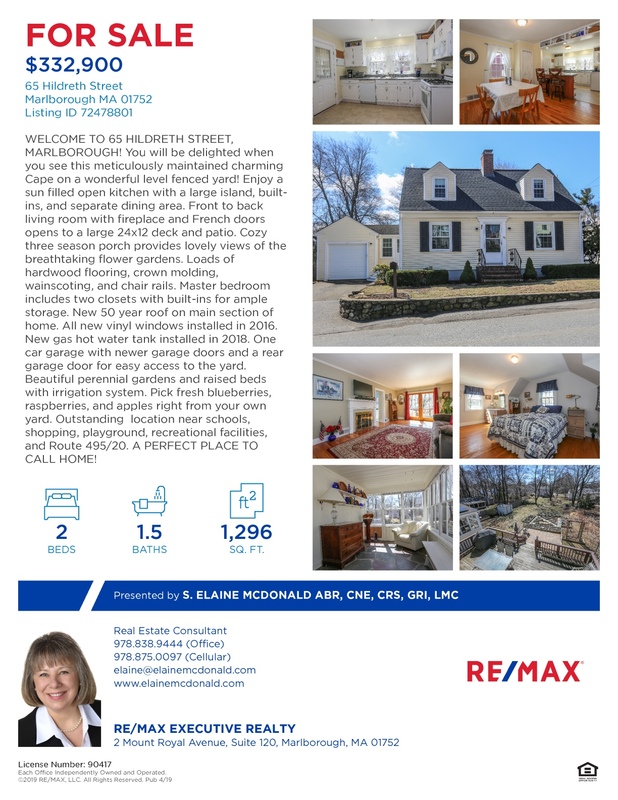 Welcome to 65 Hildreth Street, Marlborough! WELCOME TO 65 HILDRETH STREET, MARLBOROUGH! You will be delighted when you see this meticulously maintained charming Cape on a wonderful level fenced yard! Enjoy a sun filled open kitchen with a large island, built-ins, and separate dining area. Front to back living room with fireplace and French doors opens to a large 24x12 deck and patio. Cozy three season porch provides lovely views of the breathtaking flower gardens. Loads of hardwood flooring, crown molding, wainscoting, and chair rails. Master bedroom includes two closets with built-ins for ample storage. New 50 year roof on main section of home. All new vinyl windows installed in 2016. New gas hot water tank installed in 2018. One car garage with newer garage doors and a rear garage door for easy access to the yard. Beautiful perennial gardens and raised beds with irrigation system. Pick fresh blueberries, raspberries, and apples right from your own yard. Outstanding location near schools, shopping, playground, recreational facilities, and Route 495/20. A PERFECT PLACE TO CALL HOME!